General Electric fell below $12 per share for the first time since July 24, 2009. Investors appear concerned about the embattled industrial company's turnaround plan. The stock has fallen more than 11 percent this month. 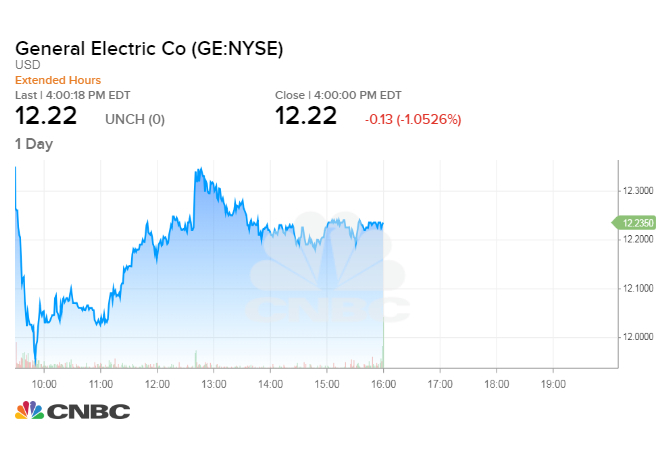 General Electric shares fell below $12 per share for the first time since July 24, 2009, on Wednesday, plowing a new low for the stock this year as investors appear concerned about the embattled industrial company's turnaround plan. Shares of GE fell 1.1 percent in trading to close at $12.22 per share. The stock slipped as low as $11.94 per share before rebounding back above $12. The stock has fallen nearly 11 percent this month, with its market value now at about $104 billion. GE continues on CEO John Flannery's plan to trim the company down to three core businesses: aviation, power and health care. Flannery said during GE's second-quarter earnings last month that he had "essentially" completed the "target of $20 billion of dispositions" he promised. GE was worth nearly $600 billion in August 2000 — a time when it was one of the most valuable companies in history. Its valuation slipped over the first decade of Jeff Immelt's tenure as CEO before taking a sharp hit during the 2009 financial crisis. But GE's value recovered to pre-crisis levels nearly as quickly, reaching as much as $300 billion by December 2015. Yet shareholder confidence began eroding sharply in January 2017, at about $31 per share. Immelt's time leading the company was defined by an unwillingness to hear bad news, over a dozen insiders revealed to The Wall Street Journal earlier this year. The overly optimistic CEO's behavior led to a number of consequences: Unrealistic financial goals, poorly timed acquisitions and even mismanagement of the company's cash. Since January 2017, shares have fallen nearly 60 percent as investors discovered a company pulled in multiple directions by its many businesses, under investigation by both the Department of Justice and the Securities and Exchange Commission and weighed down by a finance arm with about "zero equity value." GE's power business continues to bludgeon the company's earnings, with its most recent quarter showing a 58 percent fall in profits from the same period last year. A turnaround in power is going "to be a multiyear fix," Flannery said. He told shareholders that GE sees "a very clear plan of what we need to do" in power, again emphasizing the company's focus on the business. A report last week said GE is working with Credit Suisse bankers in preparation for a $1.5 billion sale of its power-conversion unit. If completed, that sale would represent less than half of what GE paid for the unit in 2011, according to the report.